As I sit here in the feeble warmth of the sun in this southern hemispheric winter, I sometimes drift away and like to imagine I am somewhere exotic. Rio maybe, where the closer you get to being naked the better. I’m talking about the local custom bikes though. 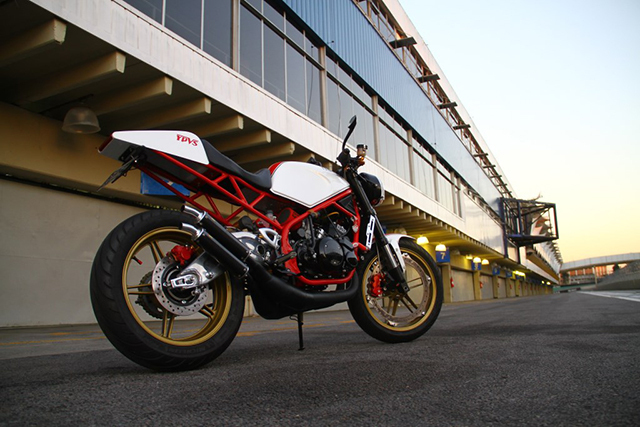 Today’s feature bike comes from São Paulo, stripped bare and proud of it. 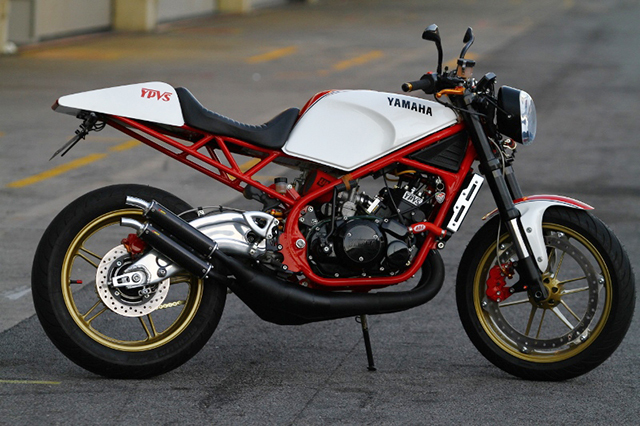 Built by Motorscompany, this Yamaha RD350LC was raised from the dead, and given numerous transplants in order to gain life again. 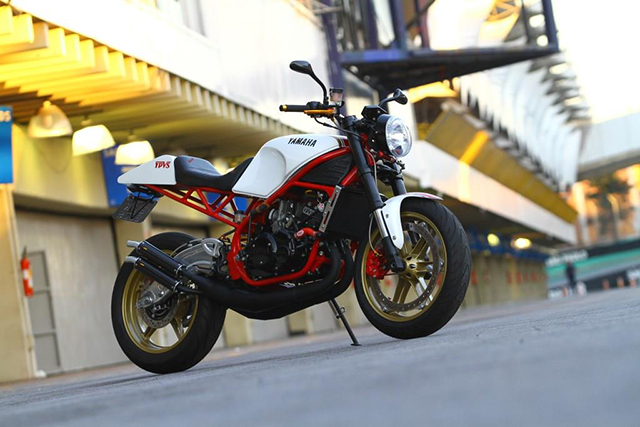 From dead stock to sports custom, the little oil burner has had mucho work done, and the results speak for themselves. Purchased is 2011, the RD was in a very sad state indeed. The frame was rusted, forks bent, seized engine, it’s the sort of bike a lot of people would just walk away from. Not Marcelo Peixoto though. He could see something in the abandoned clunker and knew what it needed. Dragging the bike back to Motorscompany workshop, the build began. First things first, the bike was stripped back to the bare frame. Every component beyond repair was ditched, the tubing in the frame under the engine cut out and replaced. 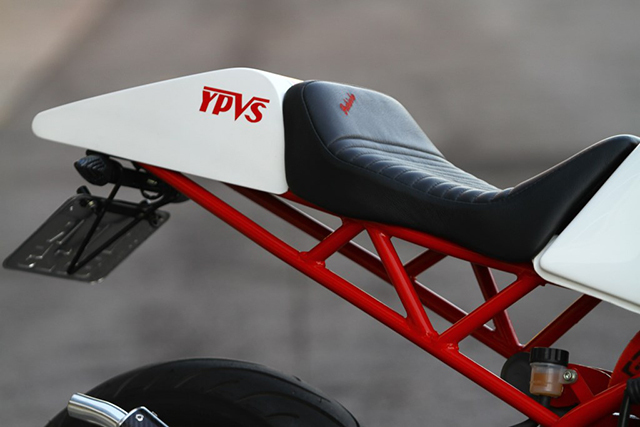 The rear subframe got the oxy treatment, the new ‘trellis’ subframe designed to convert the bike to a single seater. To enable this, Marcelo produced a single seater seat pan and ducktail, then had the seat trimmed by Pedrinho Bancos. 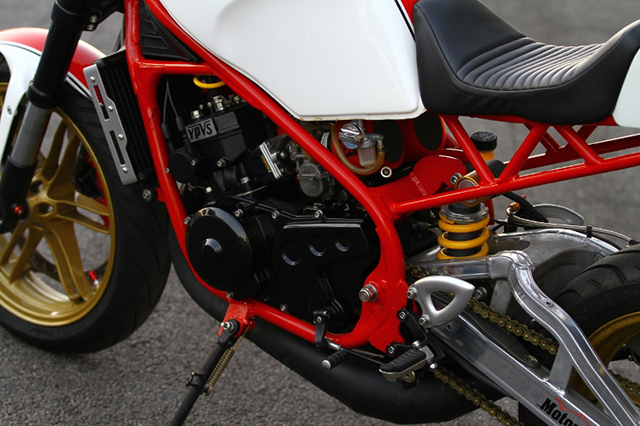 Motorscompany wasn’t looking to rebuild the bike back to original spec, so a wide range of manufacturer’s parts were utilised in the build, as well as some componentry produced in-house by Marcel and his team. And they all seem to work together rather well. 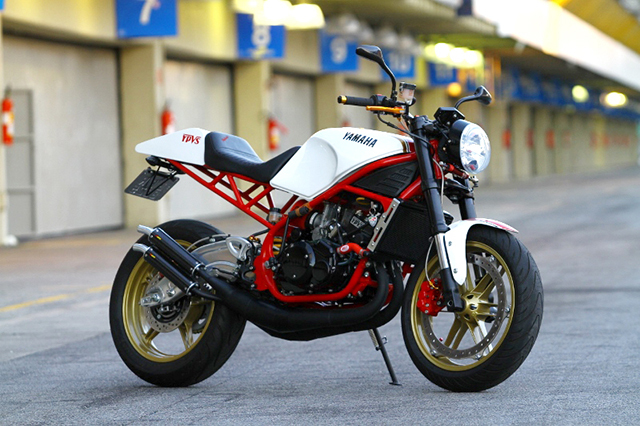 Sitting at the front end is a forkset from a Buell XB12R, featuring a rim size brake rotor which ensures that overheating won’t occur on track days. Keeping with the HD theme, a V-Rod headlight sits proud on the forks. At the rear is a swing arm from an RGV250, sprung by a Triumph Daytona 675 shock absorber. The Suzuki swing arm rounds out the tail end of the bike nicely, kicking down as it passes by Marcelo’s custom exhaust system. Once the framework was completed, Motorscompany added more power to go with these mods. The seized engine was gutted, a +4mm stroker crank fitted and carbon fibre reeds fitted. The cylinders have been ported, and Mikuni 35mm carbs fitted to pump more fuel into the engine. A high performance clutch now feeds power to the drivetrain, which will be handy for when the 421cc big bore rebuild takes place sometime in the near future. Marcelo and the crew at Motorscompany have created this Frankenstein RD, improving on the power and handling while not neglecting the aesthetics of the bike. With the paintwork courtesy of Flavio and Salim of Choppers Paint, the bike looks just as good sitting still as it does on the track. With many components coming from many manufacturers, the bike has been built to the exact style Marcelo wanted – with capabilities far beyond the bike it started out as.